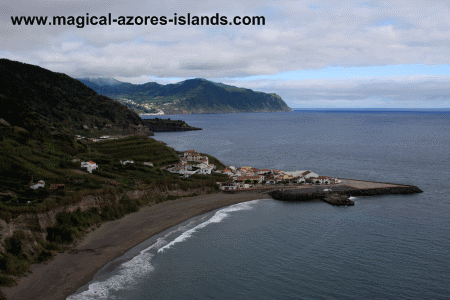 Ribeira Quente is a picturesque town on the south coast of Sao Miguel Azores. It is located close to Furnas. 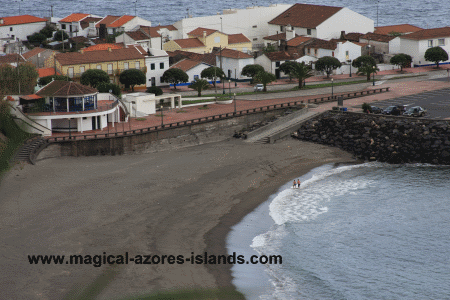 The town features a very nice beach with an avenue along the water connecting it to the fishing port and boat launch. It is easy to park by the beach and take a walk anywhere in town. I want to thank a new friend, Pastor John, for sharing these first two photos. They are from a hike he took from Furnas to the beach here. The building closest to the beach contains a change house for the beach. Tucked away behind the town (from this vantage point) is where you would find the boat launch area.